This is some of the very newest diesel traction power of DB. It is a Bombardier TRAXX diesel of Br 245. It has four engines and it can use just some of them or all of them at the same time depending on the need. 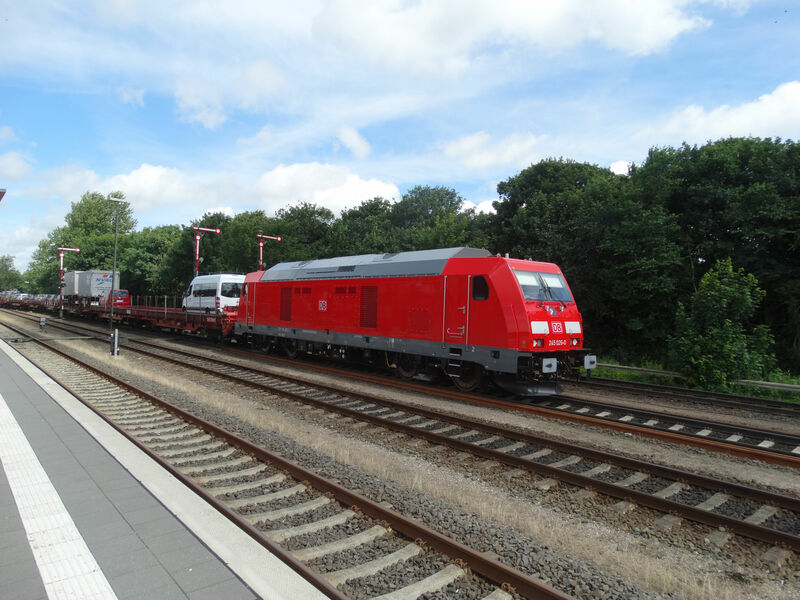 Here the locomotive is seen pulling a car train of the "Sylt Shuttle", which links the town of Westerland located on the island of Sylt to mainland at Niebüll. There is no road from the island to the mainland, but only a train line and a ferry. 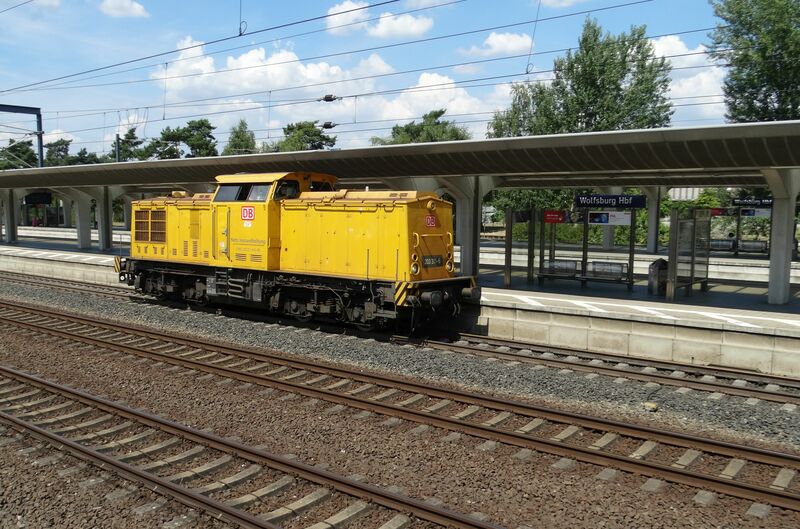 Picture at Niebüll station 9.7.2016 by Ilkka Siissalo. A "Sylt Shuttle" car shuttle train is arriving from the island of Sylt to the station of Niebüll on the mainland. 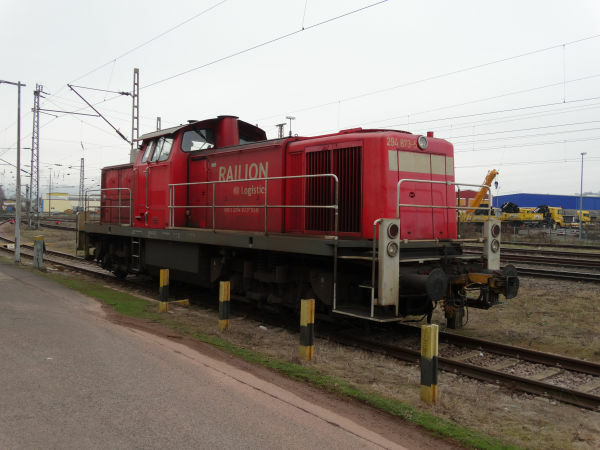 The locomotive is a brand new Br 245 multiple engine TRAXX diesel. Picture in Niebüll 9.7.2016 by Ilkka Siissalo. 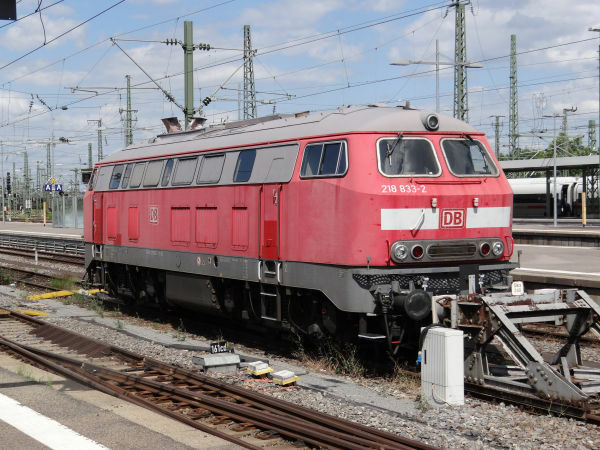 The class 294 is old, but still quite common in shunting yards throughout Germany. Gradually they are being replaced by newer machines. Picture in Trier 18.12.2016 by Ilkka Siissalo. 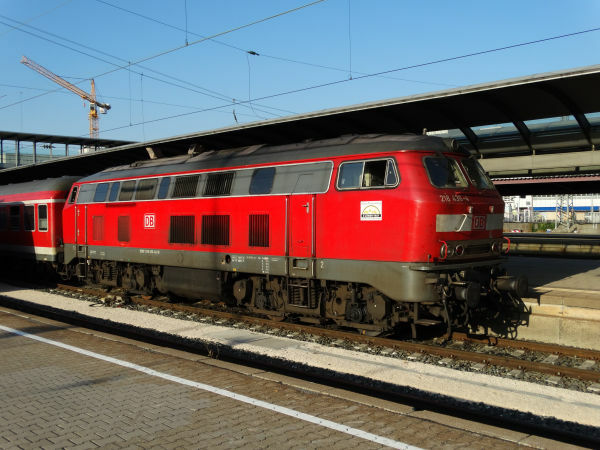 The old diesel locomotive class of V160, currently classes 210, 215, 216, 217, 218 and 225 used to be extremely common throughout Germany. These are 1960s diesel engines. Many have already been scrapped, but it is still possible to see some in daily use, like here a Br 218 machine with old "n-Wagen" or "Silberling" coaches. The painting is new, but otherwise this is pure 1960s - 1970s stuff. Picture at Ulm station 13.9.2016 by Ilkka Siissalo. It's old, it's weak, it's ugly, but it's still there. A Br 218 at Stuttgart Hauptbahnhof 8.7.2015. Picture by Ilkka Siissalo. This is DB in disguise. The modern big diesel machine which is here being towed behind a DB Br185 electric locomotive is a US built class 77 machine designed for use in Britain. The machine is marked as belonging to "Euro Cargo Rail". 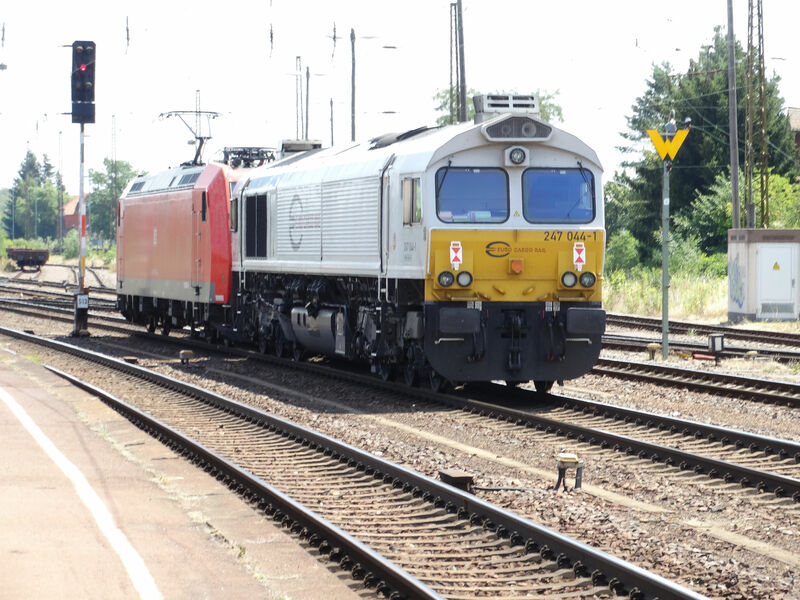 Germany and the Germans are still fairly much hated in France and Belgium, so DB operates in those countries often via the trademark name Euro Cargo Rail, which is considered to be more neutral than DB's well known red. 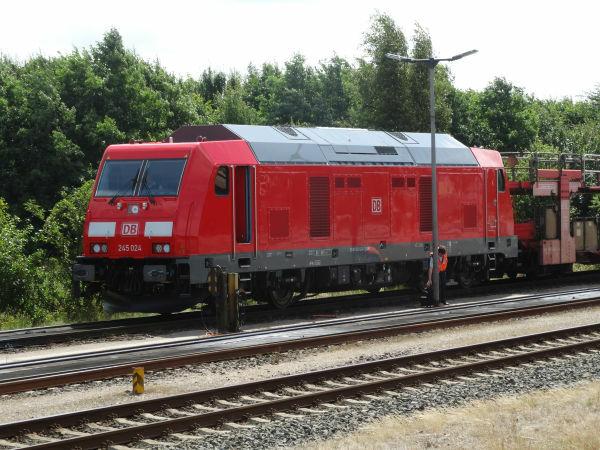 And ECR's locomotives are also often loaned by the parent company DB for use in Germany. They have for example often replaced old Soviet made "Ludmilla" diesels of Br232/Br233/Br234 in hauling heavy cargo trains. Class 77 is known by DB in Germany as Br247. It's a US machine, built by EMD and it's a further development of an earlier and very similar looking machine called class 66. They are quite cheap and are therefore gaining popularity, although train drivers hate them for being too noisy and cold. Picture of a class 77 locomotive being towed 16.7.2018 by the Coswig station near Dresden. Picture by Ilkka Siissalo. A class Br203 locomotive passing Wolfsburg Hbf. This machine belongs to the DB Netz Instandhaltung, the rail tracks maintenance division of DB. This is one of the former East German so called V100 East locomotives, which after the reunification of the two German states are known as Br202, 203 or 204 depending on the engine installed. This communist East German locomotive type was quite successful and even today a lot of them are in use, especially remotorised and by small private companies. But as here, even DB uses many of them still today. Picture from Wolfsburg 17.7.2018 by Ilkka Siissalo.